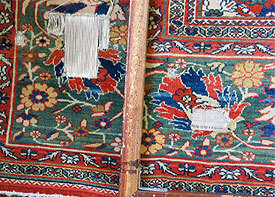 Persian rug repair for Huntington Beach is provided by Antique Rug Company. Call to schedule and bring in your rugs for an in-person inspection and advice at our showroom or to schedule pick up from you. Handmade rugs are valuable works of art. Whether antique, old, vintage, collectible, family heirloom or new, all rugs can be cared for and properly maintained as they are used. We suggest following the maintenance and conservation recommendations outlined in our RUG CARE section to maintain your rugs for many years of use. But accidents sometimes cause rug damage. 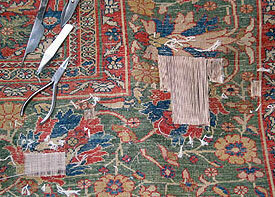 It is best to repair your rug sooner than later and avoid furthering the extent of the damage. The experienced rug weavers and restorers at our workshop provide you with maintenance, repair and restoration consultation and options. 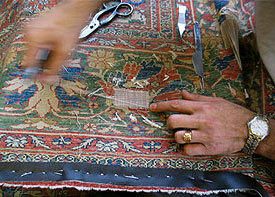 Over the years we have repaired all types of handmade or machine made area rugs — Oriental, Persian, Navajo, mechanical. And there is no project small or large which we are not able to handle. 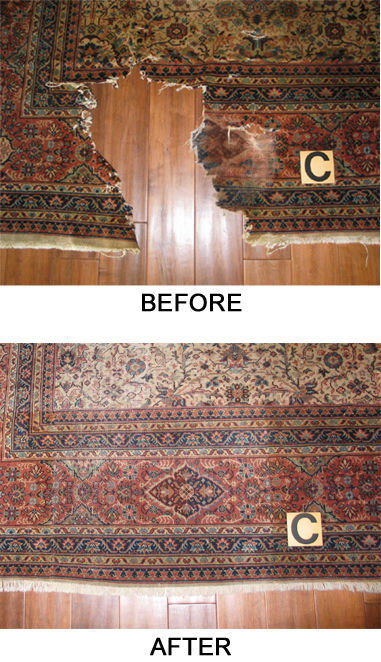 We also advise for replacement cost of your rug when restoration may not be economical.